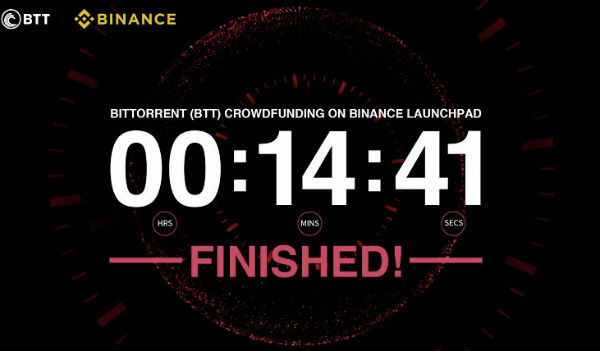 Home/News/BitTorrent Token Sold Out Quickly, But Who’s Buying? When there are any major newsworthy developments in the file-sharing world, our ‘tips’ mailbox usually fills up pretty quickly. That’s particularly true for topics many people care about. This week there was a pretty historic event in the file-sharing ecosystem. To our surprise, however, several days have gone by and we have yet to receive the first tip in our inbox. We’re referring to the token sale of BitTorrent’s new BTT token. In just a few minutes the company, which struggled financially for years, raised $7 million from investors. A pretty impressive result to say the least. Later this year BitTorrent and uTorrent users will be able to earn tokens by seeding or spend them to speed up downloads. With well over 100 million users, the potential market is huge. That said, it’s unlikely that much of the $60 million that was raised came from actual users. As with many cryptocurrency related project, most investors are ultimately in it to make a profit from trading. Those who search social media for BitTorrent-related mentions are now immersed in trading-related stats and graphs, with specialized news sites analyzing BTT’s ‘movements’ from day to day, something we’re not particularly interested in. Instead, we decided to take a look at a place where the potential BTT users reside – in the BitTorrent and uTorrent forums, for example. Interestingly, there is not even a single mention of the new token, Tron, or the “BitTorrent Speed” project in general. BitTorrent used to announce and discuss new uTorrent plans in their forums, but that’s not the case anymore. This doesn’t mean that there’s no interest all, but it looks like most of the outreach is targeted at crypto investors instead of uTorrent and BitTorrent users. Perhaps that will change later, but it certainly seems odd. Aside from this observation, we don’t want to speculate too much. BitTorrent Speed has been praised and criticized but, for now, we will follow the developments from the sidelines. That said, we’re very interested in seeing how “BitTorrent Speed” will be received once it’s live. There is little doubt that there will be plenty of torrent users who want to be “paid” to seed, but how many will pay to speed up their downloads remains a question.